Zamboangueños Show the World: Peace is Possible! "Muchas gracias, for helping put Zambo (Zamboanga City) back into the map!" Said one of the 2592 Zamboangueños who joined the 5-kilometer Peace and Freedom Run at the Climaco Freedom Park, Abong-Abong, Zamboanga City, on 24 May 2015. Located in the southernmost region of Mindanao, Zamboanga City has always been at the heart of the armed conflict between the government military and the rebel groups, specifically the Moro National Liberation Front (MNLF). The conflict went full-circle during the Zamboanga Siege on September 2013, when the MNLF attacked Zamboanga City to protest allegations of non-compliance by the government, to fulfill the provisions of the 1996 peace treaty signed by MNLF head Nur Misuari and the Philippine Government led by then President Fidel Ramos. Close to 500 members of MNLF attacked the city center on September 9, 2013, "killing 19 government forces and 208 rebels, and displaced approximately 24,000 families" (Rappler, Zamboanga siege: tales from the combat zone, 04 November 2014). The standoff lasted for three weeks-- setting the vibrant city in complete standstill, interrupting all economic activities and leaving Zamboangueños in deep fear and hunger. More than the destroyed structures, the siege left what seemed to be a chronic social wound in the region-cultural, political and religious differences became more pronounced. Peace and unification seemed to become more and more elusive. Almost two years following the Zamboanga Siege, in a city that has been beset by terror and divisiveness, the Peace and Freedom Run became a clear symbol of hope, peace, solidarity and freedom. 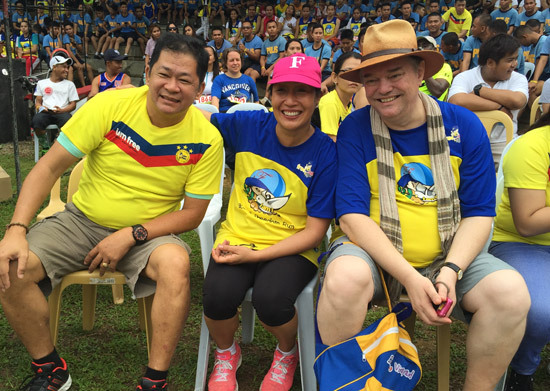 "The Peace and Freedom Run is important to the people of Zamboanga City, especially since we are in the process of rebuilding," says Mayor Beng Climaco-Salazar. FNF Philippines' partnership with the Zamboanga City Local Government strengthens the City's roadmap to recovery and reconstruction popularly known as "Build Back Better Zamboanga". This Run was made more meaningful with the active involvement of the the National Commission on Muslim Filipinos (NCMF). One of NCMF's Commissioners, Mehol Sadain, was one of the prime movers of the Peace and Freedom Run, especially in its conception stage. "The NCMF is honored to be part of this historic event that cultivates the reunification of all Filipinos regardless of religion and beliefs," said Commissioner Sadain as he addressed the thick crowd of runners before the race started. 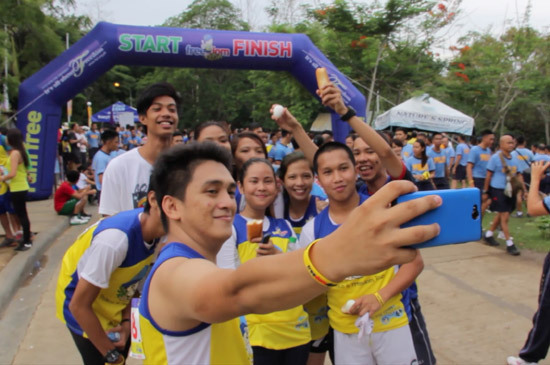 The 5-km race course was set in Climaco Freedom Park, located in a hilly part of the City. The participants embraced the route's challenge and some even started to queue for the registration as early as one o'clock in the morning, five hours before the official race schedule, only to ensure their slots in the advocacy run. 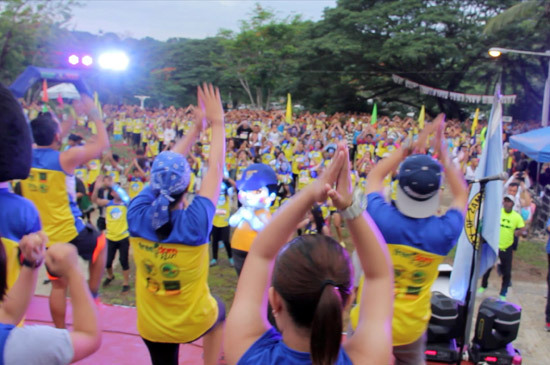 Despite waking up very early, the runners were pumped up by the Zumba warm-up led by Mayor Climaco-Salazar herself. Muslims, Christians, indigenous peoples, police and military forces alike joined the program's activities--dancing, singing and running together to finish the challenging race course. 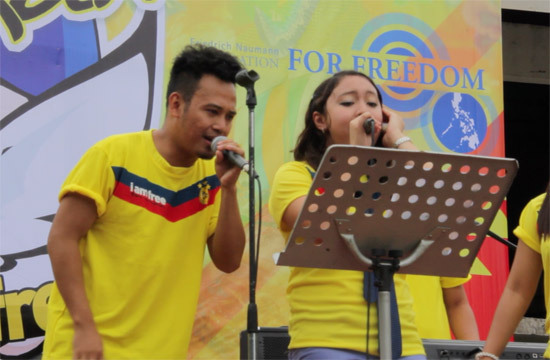 The band performers were also an event highlight-none other than the Freedom Song 2014 competition winner, Pauline Tolentino, who came all the way from Davao to perform her winning song "Malaya"; and Zamboanga City's pride, Abdel "Adz" Masjiril, who was also one of the top 15 finalists of the songwriting contest, who sang his piece on peace, "No More Tears, No More Fears". 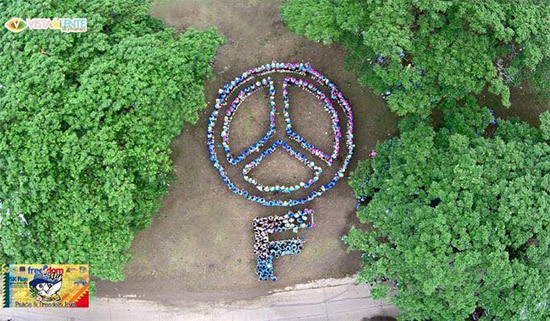 A concrete symbol of Zamboangueños yearning for peace and reunification was demonstrated by the human formation of peace and freedom (F) signs. 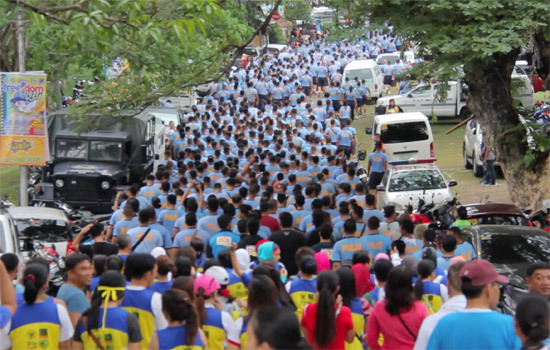 Upon finishing the 5-km run, more than 300 runners, wearing blue, yellow and magenta caps helped each other to form the colorful peace and freedom symbols. "We are for peace and freedom!" Exclaimed the participants of the human formation. "It brings so much hope to see everyone of you--regardless of the differences in belief, culture and religion-all enthusiastic to join this momentous event! By joining the Peace and Freedom Run, you are already showing the entire world that peace in this part of the country is possible. Peace is something that we all have to work on, and FNF Philippines is honored to be with you in building back a better, more peaceful and freer Zamboanga City," said FNF Philippines Country Director, Mr. Jules Maaten. Shortly after the Peace and Freedom Run, FNF Philippines went straight to the heart of the combat zone during the 2013 Zamboanga siege. Rio Hondo community is the City's "ground zero", where more than 10,000 houses were damaged by fires. To date, this community serves as one of the transitory sites of the displaced families, while it is being rebuilt by the City Government. 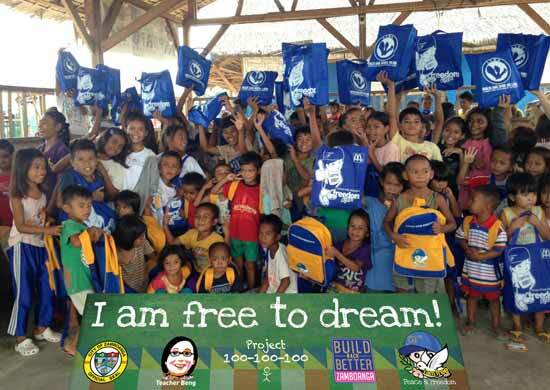 Helping to build this shattered community back on its feet, FNF Philippines, together with Project 100-100-100, distributed school bags with school and hygiene supplies to 200 kids. "These children were traumatized the most. Knowing that they can still go to school and continue to dream take away the pain and anger that they feel. These school bags save them," said community social worker Ms. Celz Alvarez. The Peace and Freedom Run capped off the month-long Summer Festival 2015 of Zamboanga City dubbed as "Summer Na Zamboanga!" (Summer is here, Zamboanga!). The event enjoyed the support of Fit Zamboanga, a local group of fitness enthusiasts that spearheaded the race course, and the sponsorship of Nature's Spring Mineral Water and Talk n Text. 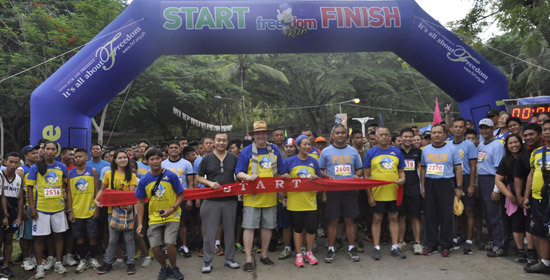 The Peace and Freedom Run is part of "It's All About Freedom" campaign by the Friedrich Naumann Foundation for Freedom (FNF), a German liberal foundation that promotes good governance, in cooperation with the Local Government of Zamboanga City.